Source: Secale cereale, Zea mays & Phleum pratense. Prostaphil-2™ is a trademark of Pfannenschmidt Ltd.
Prostaphil-2 contains defined pollen extract which is not bee pollen. Bee pollen is a mixture of whatever pollens with which the insects happen to have come into contact. Defined pollen extract, by contrast, is a mixture of several specific pollen sources. 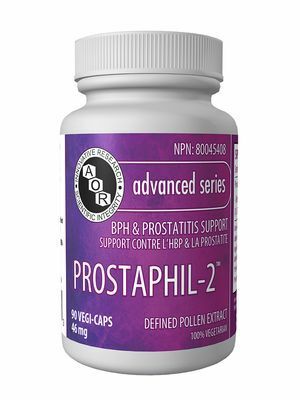 Primary Uses: Prostaphil-2 is a powerful prostate support formula designed to reduce the enlarged prostate and reduce levels of PSA (prostate-specific antigen), an indicator of both an enlarged prostate and of prostate cancer. Other natural therapies used for prostate issues such as Saw Palmetto and others merely relieve the symptoms without reducing the size of the prostate. Unlike these, defined pollen extract addresses the fundamental problem by reducing the size of the enlarged prostate, an ability that has not been demonstrated by any other herbal remedy. Secondary Uses: Research suggests that defined pollen extract can support detoxification and liver protection. Furthermore, in some parts of the world, the extract is used by more women than men because they have found the extract to be useful for the relief of urinary incontinence. Prostaphil-2 is designed for men suffering from the uncomfortable urinary symptoms of an enlarged prostate to help reduce both the symptoms and the size of the enlarged gland. It can also help lower PSA levels, which is an indicator of prostate health. Take 1 capsule two to three times daily with/without food, or as directed by a qualified health care practitioner. Use for a minimum of 12 weeks to see beneficial effects. Becker H, Ebeling L. Phytotherapy of BPH with cernilton N – results of a controlled prospective study. Urologe (B) 1991; 31: 113-6. Blumenthal M (ed). The Complete German Commission E Monographs. Therapeutic Guide to Herbal Medicines. Austin, TX: American Botanical Council, 1998. Brauer H. The treatment of benign prostatic hyperplasia with phytopharmata: a comparative study of cernilton vs. beta-sitosterol. Therapiewoche. 1986; 36: 1686-96. Buck AC, Cox R, Rees RW, Ebeling L, John A. Treatment of outflow tract obstruction due to benign prostatic hyperplasia with the pollen extract, cernilton. A double-blind, placebo-controlled study. Br J Urol. 1990 Oct; 66(4): 398-404. Dutkiewicz S. Usefulness of Cernilton in the treatment of benign prostatic hyperplasia. Int Urol Nephrol. 1996; 28(1): 49-53. Ebeling L. Therapeutic results of defined pollen-extract in patients with chronic prostatis or BPH accompanied by chronic prostatitis. In , Schmiedt E, Alken JE, Bauer HW (eds). Therapy of Prostatitis. Munich: Zuckerschwerdt Verlag, 1986; 154-60. Jaton JC, Roulin K, Rose K, Sirotnak FM, Lewenstein A, Brunner G, Fankhauser CP, Burger U. The secalosides, novel tumor cell growth inhibitory glycosides from a pollen extract. J Nat Prod. 1997 Apr; 60(4): 356-60. Maekawa M, Kishimoto T, Yasumoto R, Wada S, Harada T, Ohara T, Okajima E, Hirao Y, Ohzono S, Shimada K, et al. Clinical evaluation of cernilton on benign prostatic hypertrophy – a multiple center double-blind study with Paraprost. Hinyokika Kiyo. 1990 Apr; 36(4): 495-516. Roberts KP, Iyer RA, Prasad G, Liu LT, Lind RE, Hanna PE. Cyclic hydroxamic acid inhibitors of prostate cancer cell growth: selectivity and structure activity relationships. Prostate. 1998 Feb 1; 34(2): 92-9. Yasumoto R, Kawanishi H, Tsujino T, Tsujita M, Nishisaka N, Horii A, Kishimoto T. Clinical evaluation of long-term treatment using cernitin pollen extract in patients with benign prostatic hyperplasia. Clin Ther. 1995 Jan-Feb; 17(1): 82-7. Zhang X, Habib FK, Ross M, Burger U, Lewenstein A, Rose K, Jaton JC. Isolation and characterization of a cyclic hydroxamic acid from a pollen extract, which inhibits cancerous cell growth in vitro. J Med Chem. 1995 Feb 17; 38(4): 735-8.